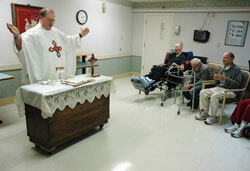 BEECH GROVE—Father Stanley Pondo is the pastor of Most Holy Name of Jesus Parish in Beech Grove in the Indianapolis South Deanery. He was ordained in 1998 and is 50. Father Pondo was born and grew up in East Chicago, Ind., in the Gary Diocese, where he was a member of St. Stanislaus Parish. Polish roots—Three of Father Pondo’s grandparents were Polish immigrants. Growing up in a strongly Polish parish, where Mass is still celebrated daily in Polish, Father Pondo came to appreciate his ethnic roots. When he was a freshman at DePauw University in Greencastle in the fall of 1978, he was pleased when his mother called to tell him that a Polish pope had been elected. As the years passed, Father Pondo’s appreciation for Pope John Paul II extended beyond the fact that he was from Poland. Slowly responding to the call—Father Pondo said he felt the call to the priesthood in his early childhood. Father Pondo spent one semester at a high school seminary founded by the Society of the Divine Word. But the idea of committing to a life of celibacy was hard for him to accept at the time and throughout his college years. That persistence manifested itself in strange moments. On the day of his college graduation, Father Pondo was congratulating a young woman whom he had once dated. She was a vocalist who was then engaged to be married. Other unexpected invitations to consider the priesthood happened during the eight years that Father Pondo worked as an attorney. They eventually helped him to be open to a possible priestly vocation. “In fact, when I first went to the seminary, I was pretty resistant to the idea of doing canon law,” he said. But by the end of his seminary days, he was committed to accepting whatever Archbishop Daniel M. Buechlein assigned him to do. In 2002, Father Pondo made plans to study canon law in Rome after the archbishop asked him to do this. That summer, he became frustrated while studying Italian near Venice. It was in that difficult time, however, that Father Pondo came to realize that, for him, obedience had only been “a favor” he did for God. Days of sadness—Because he was obedient, Father Pondo was blessed three years later with the opportunity to be in St. Peter’s Square when Pope John Paul II died on April 2, 2005. He had been the pope who had shared his ethnicity but, more importantly, had inspired him to respond to his priestly call. During the pope’s funeral, he was seated about 75 feet from his casket. Days of joy—Later that April, Father Pondo and some priest friends were watching coverage of the papal election in their home at the Casa Santa Maria, about a half hour’s walk from the Vatican. When they realized that a new pope had been elected, but before the announcement was made, they quickly made their way to St. Peter’s Square. He also was there in the square for the installation Mass of Pope Benedict XVI. When he feels most a priest—First, celebrating Mass. “I don’t think you can be a priest and not experience your priesthood most fully there,” Father Pondo said. He also highly values his priestly role as a teacher in preaching, assisting in faith formation programs and even leading parish book clubs where he has served. 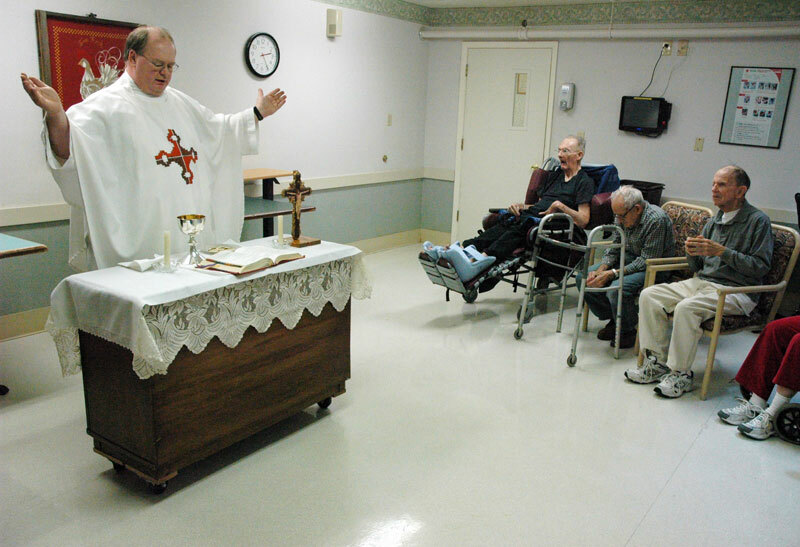 But hearing confessions has become a treasured moment for Father Pondo, although he dreaded it the first time he heard confessions during his first assignment at St. Malachy Parish in Brownsburg. “I was more scared about hearing confessions than I have ever been about going in and having to confess stuff, no matter what it was that I had to confess,” he said. But Father Pondo said that the sacrament of reconciliation has become a priestly task where he intensely sees the effect his priestly ministry has on others. Advice for those considering the priesthood—“Give the vocation a chance,” Father Pondo said. “… If God is calling a man to the priesthood, that’s the thing that’s going to make him really happy.